This ulos ragidup was woven in the Tarutung (North Tapanuli) area of North Sumatra. It measures 210 x 105 cm cm. It was given on 27 October 1942 as an ulos pansamot gift from the parents (the bride givers) of the bride, Tianur br. Hutabarat, to the parents of the groom (the bride takers) - Theodorik L. Tobing and his wife Ernestina br. Hutagalung - when their first born son, Tahi Sumurung L.Tobing, was married. It was later given by Ernestina to her granddaughter, Vera Tobing, the first born from the union of Tahi Sumurung and Tianur. The ulos ragidup is comprised of three panels. The central panel has narrow indigo and natural warp stripes and fine supplementary weft end pieces with male and female pinar halak with the female end showing in the detail below. There are supplementary warp stripes on the centre-facing edge of each of the two border panels. 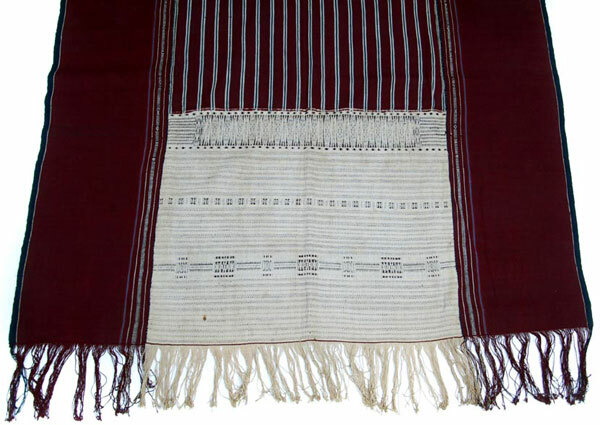 Although Tarutung is within the Toba Batak region, the style of this ulos ragidup differs somewhat from the style of the Toba Batak ulos ragidup woven in the area around Lake Toba itself more accurately called an ulos pinunsaan.